During the chilly months of fall and winter, I pretty much subsist on roasted vegetables. They’re so easy to make, and they are so delicious! Tonight I’m trying a new recipe and I can already tell it’s going to be great, so I wanted to share it right away with you. 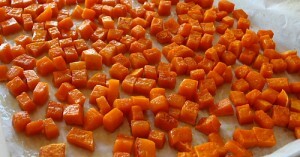 Peel and seed the butternut squash and then cut it into 1/4- to 1-inch cubes. Place the squash and the whole unpeeled garlic cloves on a sheet pan in one layer. Toss with the olive oil, maple syrup, and pepper and bake for 20 to 3o minutes, until the squash begins to brown, turning once during baking. Sprinkle the pancetta and the sage leaves evenly over the butternut squash and continue to bake for another 20 to 30 minutes, until the squash and garlic are tender and caramelized. 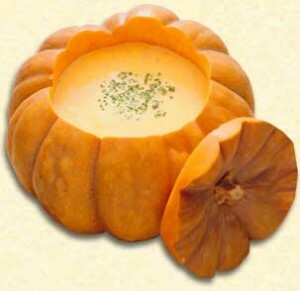 Season to taste and serve hot with French bread for guests to spread with the roasted garlic. Fall Cooking, How I Love Thee! I especially love cooking in the FALL, when the kitchen gets nice and toasty warm, and you can make a mug of tea and roast some vegetables or fill your kitchen (and eventually your stomach) with all kinds of melty, saucy, crispy, tasty, coze-you-up deliciousness. Though we often dine simply on salad or roasted vegetables around here, at least once a week I like to pull out all the cookbooks and find something more complexly delish to make. Thanks to the enthusiasm of some friends on Twitter, I decided to share a couple of my most recent successes, so that your kitchens can be even more full of goodness too. 2 tsp finely chopped fresh sage. 1. Shrimp stock. Peel and devein the shrimp, reserving the shells. Cover the shrimp and refrigerate. Heat the olive oil in a medium (3 quart) saucepan over high heat until it begins to smoke. Add the shrip shells to the pan and cook, stirring constantly, until they turn deep orange and are just beginning to brown, 3-4 minutes. This step–pan-roasting the shells–gives the stock much of its flavor, so take the time to do it carefully. The roasted shells should release a concentrated, toasty, shrimp aroma that will fill your kitchen. Add the wine to the pan, first turning off gas flames to prevent the alcohol from igniting, then boil it over medium heat until all the liquid is evaporated. Add the chicken stock, saffron, celery, onion, bay leaves, and sage. Bring to a boil, then reduce the heat to the lowest setting. Partially cover the pan and summer gently for 30 minutes. Strain the stock through a fine sieve, pushing down on the solids with the back of a spoon to extract all the liquid. Rise out the saucepan and pour the stock back into it. Pour the olive oil into a large saute pan placed over medium heat. When hot, add the reserved shrimp and the sage and cook, tossing often, until the shrimp is just cooked through, pink, and no longer transluscent, but not curled into a circle: 2-3 minutes. They should still have a tender snap when you bite into them. Arrange the shrimp in warmed soup bowls or a serving tureen. Bring the soup back to a simmer and then ladle it over the shrimp. Serve right away. Preheat oven to 250 degrees. Heat butter, sugar, and corn syrup in a small saucepan over high heat. Cook, stirring, until butter and sugar melt and a candy thermometer reaches 255 degrees. Remove from heat, and stir in rosemary, salt, and baking soda. Pour mixture over popcorn, toss. Transfer to a baking sheet. Bake, stirring occasionally, until dried, about 45 minutes. (So she says; mine took about 25 minutes before the caramel started singeing, but maybe that’s because I had a parchment-lined baking sheet?) Let cool before serving. Grow Ideas In the Garden of Your Mind, And Bring On the Roasted Potatoes! In the midst of all the details that I need to nail down to finalize things for the AJC Decatur Book Festival, coming up Labor Day weekend (it’s my job to do all the programming), it’s always fun to take a nice break with old friends. For me this week, that includes Mister Rogers and Julia Child. These remixes are genius (and fun), not to mention holding some good advice for life, I wanted to share them with you.